Senn, Jimmy Simmons. The trumpet section plus Andy Dennitts (p) are not included. Tommy Sampson (standing). 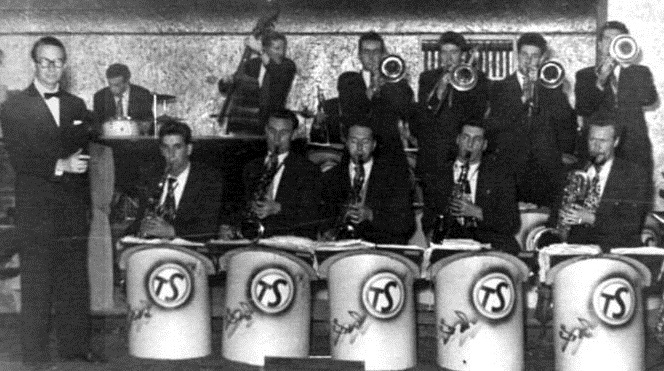 In 1946 trumpet player Tommy Sampson created a touring big band that has achieved almost legendary status if you read the comments of the musicians who played in it. Many well known names cut their teeth in the band, some of whom went on to join Ted Heath, and others such as Hank Shaw, Joe Temperley and Phil Seamen made their way into the jazz world. Although the band made a few records none have ever been commercially issued. Tommy Sampson was born in Scotland in 1918 and in early childhood was playing cornet in a Salvation Army band. He joined the Army in 1939, was taken prisoner by the Italians at Tobruk and remained a prisoner-of-war until 1945 when he was repatriated to Scotland. He led the Scottish Command Dance Orchestra until he was demobilized in June,1946 when he formed his own big band. This made it's debut in Leith, Scotland in January 1947. The band subsequently toured Britain, Italy and Germany playing a number of ballroom residencies until December, 1949 when his ill health caused him to disband. He then worked in London for various music publishers during the early 1950s as an arranger and song plugger and sang with the George Mitchell Choir and the Sapphires vocal group until 1954 when he began to devote as much time as he could to Salvation Army activities. He moved back to Scotland and later formed his own band that worked in the Glasgow area until the early 1990s. He died at the age of ninety in 2008.
" The great British big bands of the post war years, roughly in order of merit, were Ted Heath, Geraldo, Tommy Sampson, John Dankworth, Jack Parnell, Vic Lewis and Eric Delaney. The personnel of these bands changed constantly. There was so much work around that the musicians could more or less choose the bands in which they wished to play. The British big bands were all clones of the great Glenn Miller and Tommy Dorsey Orchestras. Very few of them played any of Miller's music, but they all had the same 4 trumpet, 4 trombone, 5 saxophone, and four rhythm line-up. Most of them had two or three singers, and perhaps a vocal group formed from the ranks of the players. As regards style, this was determined by the people who wrote the arrangements for the bands, and the way the players interpreted their scores. The two best road bands I played with in Britain were those of Tommy Sampson and Johnny Dankworth ". During the 1940s Sampson's principal arranger was Edwin Holland, a man described by Tony Middleton as "a brilliant composer / arranger". January 23rd, 1947 The band had started rehearsals at the end of 1946 and made it's debut at Leith in Edinburgh, Scotland at the Eldorado Palais with the following personnel: Stan Reynolds, Harry Hall, Duncan Campbell, Bill Owen (tp), Bill Stevens, Ralph Hutchinson, Mick Freeman, Andy Young (tb), George Hunter, Jimmy Paxton (as), Henry Mackenzie (cl,ts), Bob Humphries (ts), Tommy Carroll (bs), Sam Harding (p), Eddie Canale (g), Sammy Stokes (b), Teddy Hill (d,vib), Tommy Sampson (tp,dir). July 25th, 1947 The band came to London in late June, 1947 for a BBC audition and on the 25th made a private recording at Levy's Studios. The band recorded Four O'clock Jump, composed and arranged by Edwin Holland. The band made further broadcasts, including one on French radio, and one live from the Aquarium Ballroom in Brighton in the period August to October, 1947 with minor changes to personnel. Denny Dennis, Terry Walsh and Dinah Kaye took the vocals. Bebop trumpeter Hank Shaw joined the band in the middle of October for a two week engagement at Green's Ballroom, Glasgow. The band was now featuring a 'band within a band' - the Henry Mackenzie Quintet, Henry + rhythm. On November 16th, 1947 the band made a second private recording at the Rialto Cinema in York. The band now included future jazz star Joe Temperley on tenor sax. Two titles were recorded: To beat or not to beat that featured Joe Temperley and Old man river that had a trumpet solo, possibly Hank Shaw. The band made another BBC broadcast on November 20th. Stan Reynolds, Duncan Campbell, Alec Macgregor, Bert Courtley (tp), Ralph Hutchinson, Andy Young, Johnny Kirkwood, Clare Walsh (tb), George Hunter, Lew Warburton (as), Henry Mackenzie (cl,ts), Joe Temperley (ts), Jimmy Waugh (bs), Dave Simpson (p), Terry Walsh (g), Sammy Stokes (b), Dougie Cooper (d), Tommy Sampson (tp,dir). Besides the ballroom bookings the band continued to broadcast regularly on the BBC in programmes such as Band Parade, Listen to the Band and Dancing at Midday. There were personnel changes, Bert Courtley was replaced and Ron Simmonds was added to the trumpet section. This meant that they now had a six man trumpet section when Tommy Sampson played. Duncan Cambell left in February, 1948 later to become established in the Ted Heath Orchestra. Alan Dean returned as vocalist for a short while in early 1948. Around this time Sampson replaced his second alto with another tenor sax to give the band a Woody Herman 'Four Brothers' sound. By the time the band broadcast for the BBC General Overseas Service in "Music for Dancing" on June 26th, 1948 the band personnel was: Stan Reynolds, Terry Lewis, unknown, unknown (tp), Johnny Keating (tb,arr), Ken Goldie, Wally Smith, Maurice Pratt (tb), Charlie Payne, Mike Senn (as), Henry Mackenzie (cl,ts), Joe Temperley (ts), Jimmy Simmond (bs), Dave Simpson (p), Johnny Hawksworth (b), Dougie Cooper (d), Terry Devon (vcl), Tommy Sampson (tp,dir). The band was on the road again making regular broadcsts for the BBC until the end of July 1948. August 9th, 1948 the band departed from England for a three month tour of Europe (including Germany and Italy) playing for the Forces throughout the British Zone of Occupation. The band personnel was: Mike Asher, Chick Norton, Charlie Evans, Stan Hibbert (tp), Johnny Keating (tb,arr), Ken Goldie, Wally Smith, Jack Wilson (tb), Charlie Payne, Mike Senn (as), Henry Mackenzie (cl,ts), Joe Temperley (ts), Jimmy Simmond (bs), Andy Dennits (p), Johnny Hawksworth (b), Dougie Cooper (d), Terry Devon (vcl), Tommy Sampson (tp,dir). Rosemary Squires (vcl) joined early on in the tour and Ronnie Simmonds who was serving in the armed forces in Germany was added to the band occasionally. The band also did some radio broadcasts in Italy and Germany. Returning to England Phil Seamen (drums) replaced Dougie Cooper. The band continued to play one nighters but as bookings became scarce it was reduced in size. Following a three week engagement at the Pier Ballroom, Redcar from late December, 1948 to January 22nd, 1949 with a smaller band, Tommy Sampson disbanded and returned to Edinburgh. The small band personnel for this engagement was: Tommy Sampson (tp), Johnny Keating (tb), Henry Mackenzie (cl,ts), Jimmy Simmond (bs), Andy Dennits (p), Andy Wayne (b,vcl), Al Hall (d). After a short respite Tommy Sampson reformed his big band and the new band made it's debut at the Hammersmith Palais on March 7th, 1949 with the following personnel: Ted Brennan, Ronnie Simmonds, Pete Pitterson, John O'Rourke (or Terry Lewis) (tp), Johnny Keating (tb,arr), Jimmy Wilson, Jack Wilson, Tommy Cooke (tb), Charlie Payne, Bill Skeat (as), Henry Mackenzie (cl,ts), Danny Moss (ts), Jimmy Simmond (bs), Andy Dennits (p), Terry Walsh (g,vcl), Sammy Stokes (b), Dougie Cooper (d), Lynda Russell (vcl), Tommy Sampson (tp,dir). Mike Senn depped for a sick Bill Skeat on this date only. During the summer of 1949 there were frequent changes in personnel. Peter Ind (bass) and Phil Seamen (drums) came in for a broadcast in June and Harry Klein (alto) played occasional dates during July/August, 1949. Johnny Dankworth is reported to have sat in for some radio dates. Bop was now a factor and a broadcast in September, 1949 featured, from within the band, the Danny Moss Bop Group playing Robbin's nest. Danny Moss and Phil Seamen had left by late September, 1949. Sammy Walker may have replaced Danny Moss. The band made it's last broadcast on October 8th, 1949 in Saturday Night Dance Date. Tommy Sampson's portion came live from the Winter Gardens, Eastbourne. The other bands playing from different venues were Lou Preager and Oscar Rabin. Full band personnels are not available for the last few months but musicians known to be in the band over the last few months were: Colin Wright and Pete Pitterson (tp), Norman Ledgard and Ken Goldie (tb), Roy Bull (baritone sax), Terry Walsh (g) and Jimmy Hallam (bs). After dates in Aberdeen and Newcastle (last known date was Newcastle Odeon) Tommy Sampson disbanded probably late in December, 1949. Tommy Sampson and his Orchestra recorded only two titles (for Decca) and for some reason these were never issued, and the masters are believed to have been destroyed. Ted Heath and his Music recorded regularly throughout the second half of the 1940s, also for Decca, and most of these many titles are available today on CD. Many Heath musicians had a spell in the Sampson Orchestra - it would have been nice to have a musical legacy from Tommy Sampson's reportedly superb orchestra. This page was last updated during February, 2014.